Here's the sign, pointing east from the road from Animas Forks to Silverton. 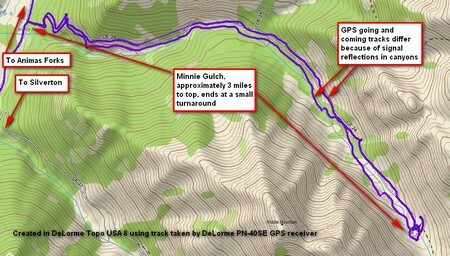 As it turns out, the road up Minnie Gulch is only about three miles long. The climb is gentle in most places but not everywhere. A few times it becomes suddenly steep. Mostly, this would be a good road for a beginning dirt bike rider with a couple months riding experience tucked under his/her belt, except there are a couple rockfalls where there simply isn’t any road—you just have to cross. Best to stand up, look ahead at where you want to be, keep the speed up (first gear) and be prepared for the bike to be really squirrelly underneath you. 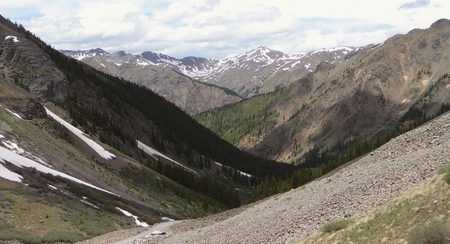 Minnie Gulch travels east from the road between Silverton and Animas Forks. Note an interesting thing: the going and coming tracks don’t lie right on top of each other. In fact, they’re as much as 450 feet apart in places. This is because of reflections of the GPS signals from the canyon walls. The moral of the story is this: don’t trust the GPS’s own estimation of its error, even with WAAS turned on. You can be more than the length of a football field off. 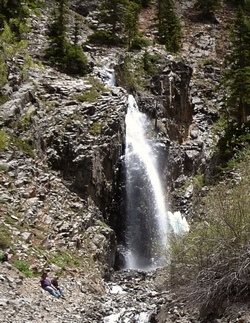 The elevation gain is somewhat less than 2,000 feet, from 9800 feet at the start to 11,600 feet at the top. This puts you well above tree line. The road is just a hair more than 3 miles long and I did the loop in a half hour, which included time for pictures. This is the view up the canyon from the end of the road. The view up the canyon toward the pass at the top is interesting. 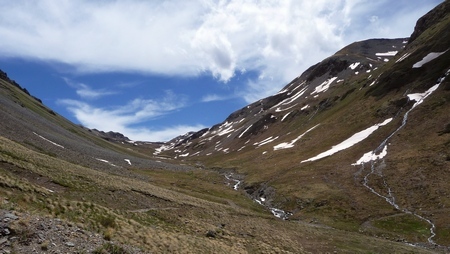 This is a U-shaped canyon, indicating it has been glaciated in the past. The view down the canyon indicates only deep, V-shaped walls, so the turnaround apparently was at about the bottom limit of glaciation. Here's the view from the end of the road looking back down the gulch. The road is scenic, winding through tall trees and past ruins of old mining shacks. One waterfall was particularly scenic. If you look closely, you can see two folks sitting near its base and admiring it. I waved; they waved back. This beautiful and powerful waterfall is right near the rockfall you have to cross. Note the tiny people (bottom left) for scale. This entry was posted in GPS Tracks, Motorcycling, San Juan County. Bookmark the permalink.